This month’s Secret Recipe Club assignment definitely creeped up on me, I must admit. It’s been a crazy few weeks here, between Bella’s 5th birthday, end of summer/getting ready for school, and her first day of Kindergarten being today! Combine that with a few other personal things going on and it’s been nothing short of hectic. I actually bookmarked this recipe when I first got Phemomenon as my assigned blog, but almost let it slip by…good thing I had my nieces over for dinner and needed to come up with a dessert! Holly is a super busy mom that sure has a lot on her plate, but seems to manage it all like a pro. She’s got a lot of great recipes, so be sure to check out her blog soon! This is a recipe that everyone should have in their arsenal – a big crowd pleaser (for kids AND adults) that’s super easy to make. Be sure to check out all the great recipes from Secret Recipe Club this week! In a microwave safe bowl, mix cream, corn syrup, brown sugar, cocoa powder and salt. Microwave on high for about one minute, and stir to smooth out. Add chocolate and butter and let sit for one minute. Stir until smooth. Place back in microwave for 30 seconds, or until smooth. Add vanilla and stir. Use immediately, or store in refrigerator after cooled. To use after refrigerated, heat in microwave for 10 seconds at a time until smooth. This entry was posted in chocolate, dessert, ice cream, QuickAndEasy, Secret Recipe Club. Bookmark the permalink. 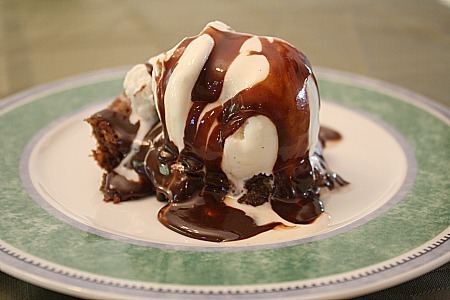 I love this recipe and hot fudge is on my last meal list with chocolate cake and vanilla ice cream. I could dive right into that bowl. I love that you chose this one! It’s a definite favorite of ours. My youngest boy just started kindergarten too so I feel you. I hope all went well and she had an awesome day! What’s not to love about a 5 minute recipe? Especially if that recipe involves fudgy chocolate 😉 This sounds awesome! That looks so good. And easy. I will definitely have to try this. looks so simple and flavorful!